Noaa 12738 from yesterday April 14th - SolarChat! I saw many good shots here, congratulations to all, this is my contribution yesterday. White light whit 6" refractor and 6mt of focal length and Hershel wedge. 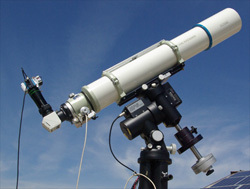 Baader K-line and H-alpha (pst mod) with 4,8mt of focal length. Wow, 5 and almost 6 meters of focal length..... Was the seeing that good? An excellent set of images. Lovely CaK line and WL. Nice details.